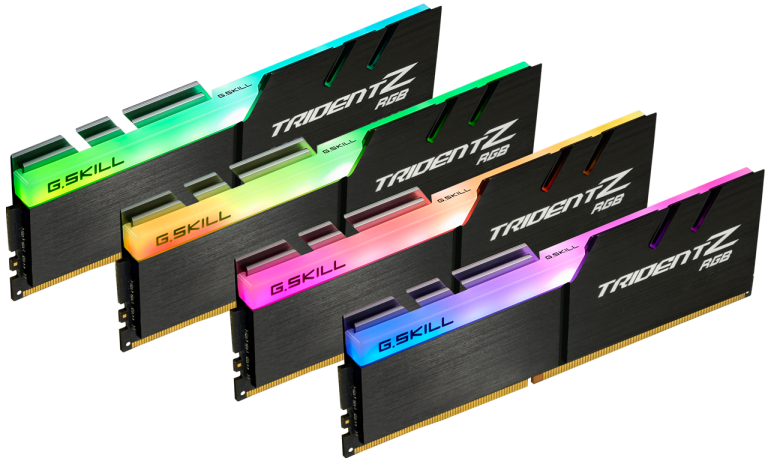 In the never-ending battle of one-upmanship that is the memory market, veteran G.Skill has released a new Trident Z RGB quad-channel 32GB DDR4 memory kit which is capable of running at 4,266MHz, making it the fastest currently available RGB memory in a 4x8GB configuration. The new record builds upon an existing one also held by G.Skill, as its dual-channel Trident Z RGB 16GB kit has been the highest capacity RGB kit available capable of running at 4,266MHz – until now, of course. Doubling the capacity of the kit is not just a case of adding two more modules, because populating a single memory channel with two sticks over one places considerably more stress on the memory subsystem. G.Skill claims that overcoming the capacity burden has been made possible by the recent Z370 chipset release and more specifically with the aid of Asus OptiMem technology, a new feature exclusive to Asus Z370 motherboards. OptiMem is designed to boost memory signal integrity by routing the signal-carrying traces through the optimal PCB layer, and it also uses a T-Topology layout whereby the trace length between the memory slots in a given channel and the CPU are equal. This boosts stability when running high frequencies with both DIMM slots filled when compared to daisy chain topology when one trace is shorter than the other. The new kit was stress-tested in a system built with an Asus ROG Maximus X Hero (Wi-Fi AC) motherboard and Intel Core i5-8600K. The memory modules are built with Samsung B-die DDR4 ICs and validated to run with 19-23-23-43-2T timings at 1.4V. Physically, the kit resembles all other Trident Z RGB kits with a fully exposed light bar on the top and a brushed aluminium heatspreader enclosing the modules. The lighting pattern of the onboard LEDs is set to a rainbow wave effect by default, but G.Skill offers beta software to help you customise the colour and effects, and the modules are also compatible with Asus Aura Sync on supported motherboards. RAM companies have lost the plot entirely. I got 16GB of 2400MHZ DDR4 for only £56 this year. Even if I get around to buying a new CPU,I will be using that RAM,since I am not paying £100s to get for a few FPS increase in games. I mean £500 gets you an XBox One X!! Cool, another step towards DDR5. £500 for 32GB ? No, just no.